While reading a recent issue of Artful Blogging, I came across a phrase that I just loved: “He dreamt of perfectly sculpted gardens; I fantasized about weeds and wandering creepers.” The writer, Penny Elizabeth Neil, was talking about the difference between her and her brother, but “weeds and wandering creepers” really spoke to me. When we travel, those are the spots I am looking for. Perfectly sculptured gardens are lovely, but they aren’t nearly as interesting as overgrown ruins. 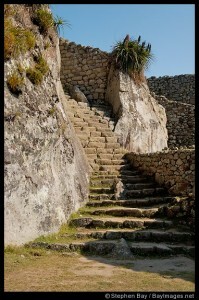 A crumbling stairway at Machu Picchu, Peru. Some of the places we come across on our trips are just magical. 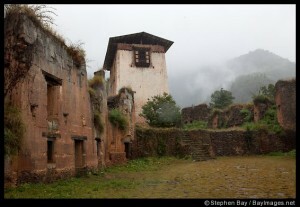 When we visited the ruins of Drukgyel Dzong in Bhutan, I told our guide it was almost a shame to restore the fortress. Seeing the vegetation slowly reclaim the land is a powerful reminder of the impermanence of humans. It was one of my favorite spots in Bhutan. We visited on a misty morning and it was so beautiful, I could have spent the day there. If it hadn’t been raining, I would have gotten out my sketchbook. 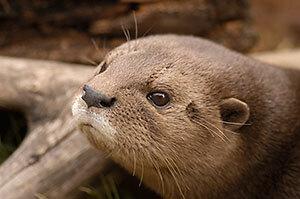 Of course, if it hadn’t been raining, we would not have been the only ones there. The ruins of Machu Picchu in Peru are also immensely appealing to me. It was unfortunately more crowded there than at Drukgyel Dzong. It is the kind of place where I wish I could be there all alone, just to sit and contemplate. Check out more of Stephen’s pictures of Bhutan. Check out more of Stephen’s pictures of Peru.